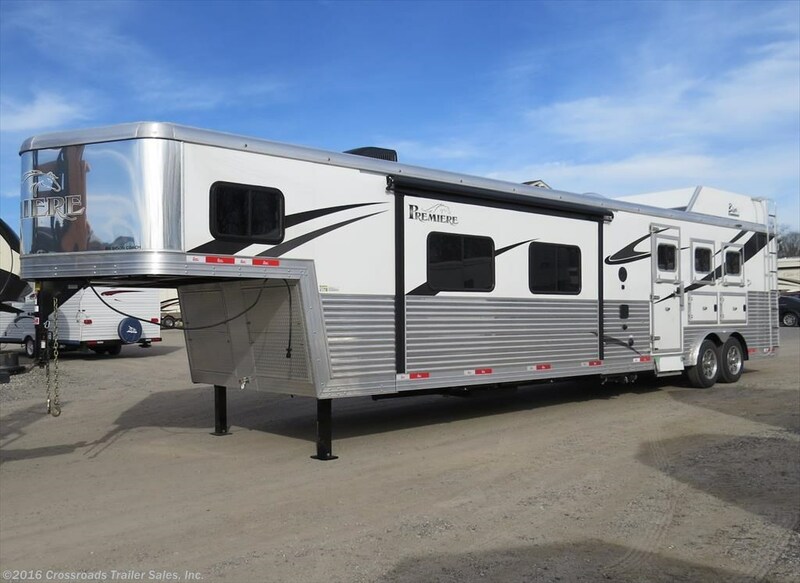 Stylish, luxurious and engineered with safety and function in mind, the Bison Premiere line of living quarter horse trailers for you and your equines is truly a ride ahead of the herd. Bison, the leading manufacturer of horse trailers with living quarters, takes equine trailers to a new level with its 2016 Premiere line, which features top-of the line finishing for you and your horses. 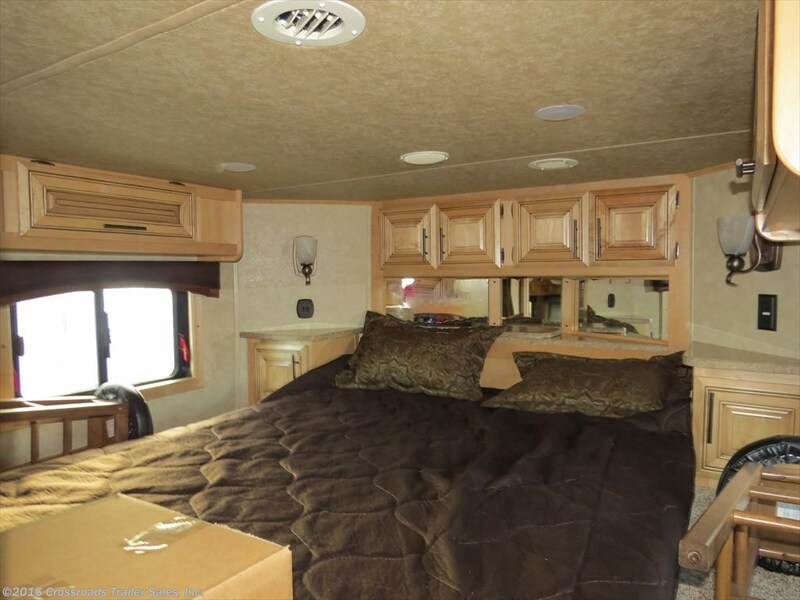 When the road is your home, the show grounds your park, or if your travels include trail riding, the Bison Premiere fifth wheel models offer home-like comforts usually reserved for the luxury RV market, from the private master bedroom to raised-panel wood kitchen cabinetry. For 2016 Bison Premiere offers 3 and 4 horse slant models complete with optional manger and generous well-organized tack room. The luxuriously appointed living quarters are cooled with a quiet and powerful ducted air conditioning system and include a full-sized slide for comfortable living as well as a private queen bedroom. Whether it’s a trailer for three or four horses, the 2016 Bison Premier features all-aluminum frame construction and exterior for a tow loaded with luxury, not weight, even at more than 40 total feet. A heavy-duty goose neck coupler is illuminated by a convenient hitch light to make hook-up painless. Travel smoothly on the dual axle chassis then enjoy full-hook up or self-contained camping. A closer look at the Bison Premier 8317 gives insight to the quality and design the 2016 Bison Premiere Living Quarter horse trailer models offer. Enter the living area into an expansive kitchen featuring Amish-crafted, solid raised panel spiced maple or walnut cabinetry that creates a solid, stylish look while providing ample overhead and base cabinet storage. 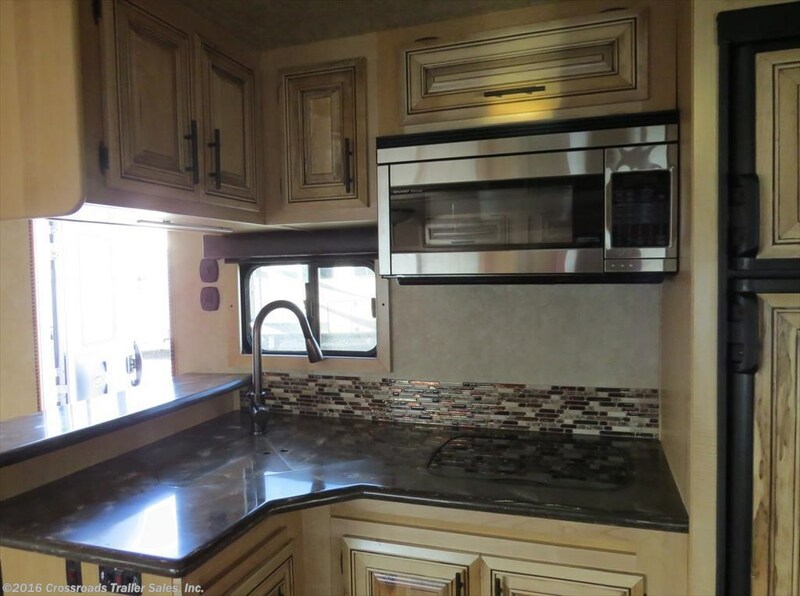 Upgraded solid surface counter tops provide plenty room for preparing family meals and a built-in 6-cubic foot refrigerator holds enough to feed your equine enthusiasts. A residential-sized stainless steel convection-microwave oven and upgradeable two-burner stove keep cooking quick and the living quarters cool. The unique L-shaped kitchen features a stainless steel, residential-grade sink positioned below a raised counter that adds seating space for two; perfect for a quick breakfast, snack or enjoying a cup of coffee in the morning. The kitchen’s coordinated decorator back splash, and durable and beautiful residential grade wood-grain style flooring helps keep maintenance time to a minimum. A 16-foot, carpeted, flush-floor slide out expands the open plan living and dining area. Tucked into the slide is a generous booth for family dinners, game time or entertaining. A Bison exclusive “Visionary” sofa shares the slide, creating a cozy multi-function living area, topped by additional, raised panel overhead storage. Both the dining area and sofa convert to create additional sleeping capacity for family and friends. 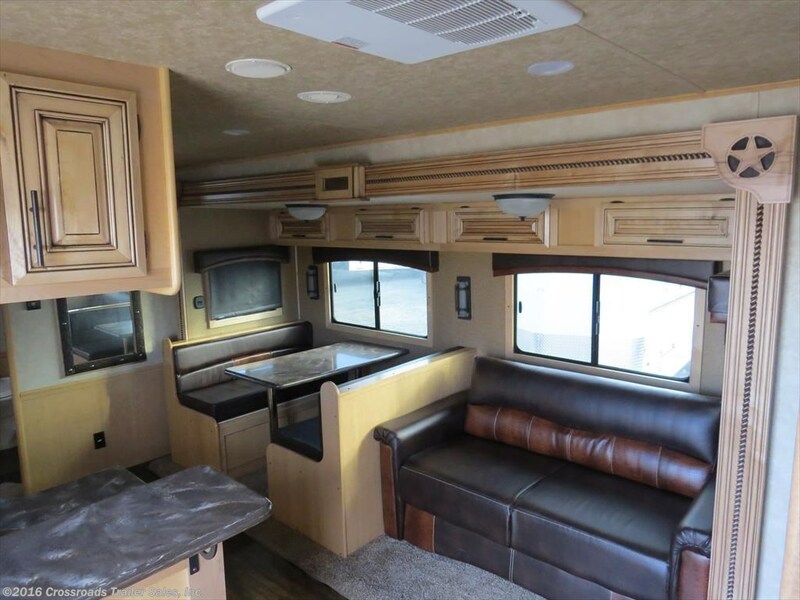 An exclamation point to the living area is the built-in, storage-rich entertainment center, featuring an LED TV and electric fireplace, giving the coach the look, feel and comfort of a high-end RV. Energy efficient LED lighting and vinyl valances with auto roller shades are included throughout. Behind the entertainment center, step up to a private queen bedroom, with matching nightstands, overhead storage, shirt closet and storage closet. Doze off while watching the TV in the Bison Premiere’s second entertainment center. Step down and walk back, across the unit to the surprisingly large and functional bathroom. At the entrance to the bathroom is a floor-to-ceiling wardrobe. Inside the bathroom, experience the storage and comfort you might expect to find in a top-of-the-line coach, including a large radius shower, with residential style, oil-rubbed bronze shower faucet and hand wand, enclosed by a glass door as well as a walk-in storage closet and large linen cabinet. A porcelain commode, bath vanity with solid surface top and porcelain sink, and mirrored medicine cabinet complete the bathroom. 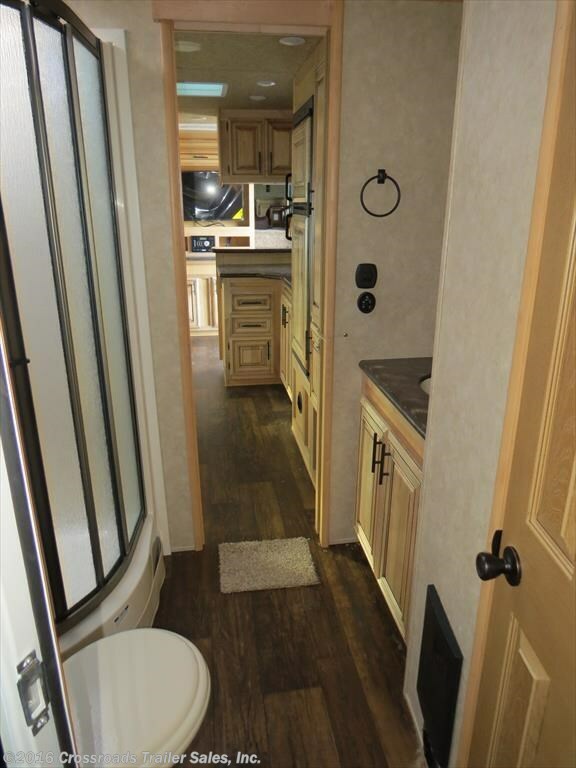 Access the horse trailer area directly from a convenient full-sized door in the bathroom. The horse area is lined and insulated, with stud stall padded stalls, pop up roof vents, jail bar dividers, LED lights, and fans. 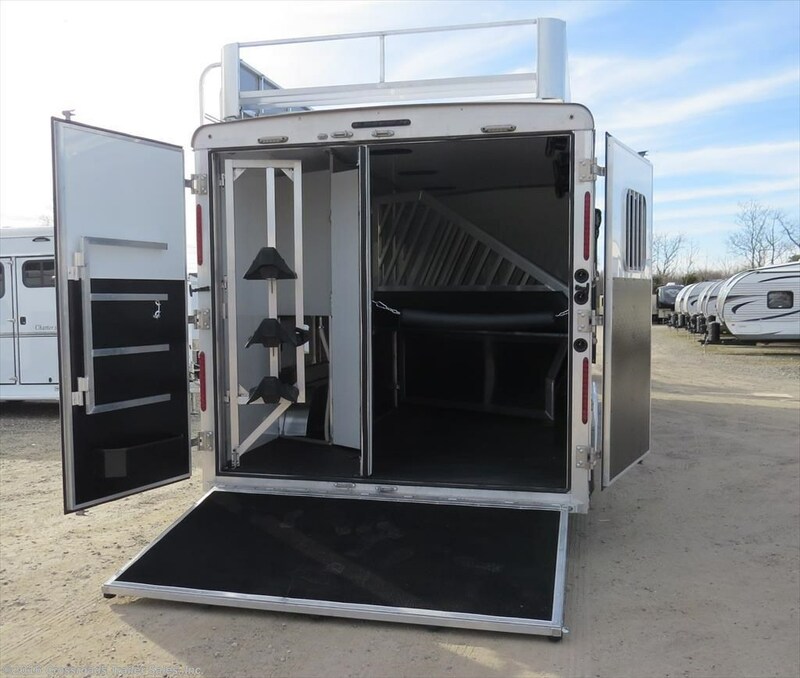 The area features a collapsible rear tack area with saddle racks, bridle hooks and brush tray. The rear aluminum constructed doors feature double cam-bars for a tight seal, while positive slam latched horse gates are comfortably padded for your horses. The Bison Premiere line includes several other models, with and without a dinette, and with slant three and slant four options. 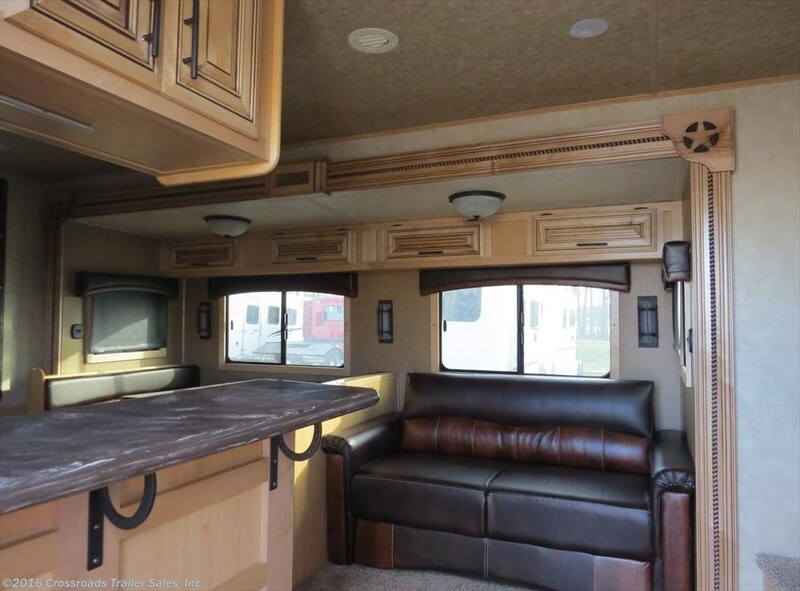 Across the 2016 Bison Premiere living quarter horse trailer line is the look and feel of a high-end motor coach with the quality and functionality of a top-of-the-line working horse trailer. To see how the Bison Premiere can fulfill your living quarter trailer needs visit the horse trailer experts at Crossroads Trailer Sales.